New research report expects market to double by 2023 driven by demand for omni-channel, new cloud communication platforms & shifting consumer preferences. 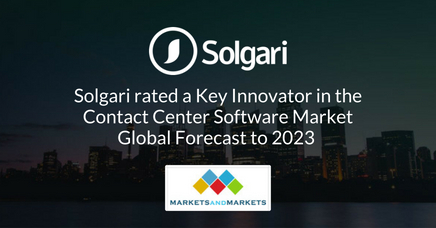 LONDON – 8th August 2018 –In a new, far reaching report titled ‘Contact Center Software Market Global Forecast to 2023’, leading analyst MarketsandMarkets names Solgari as one of three key innovators in a market that is expected to grow to over US$35 billion in global revenues by 2023. Solgari provides a compliant, integrated omni-channel cloud communications solution, driving instant digital transformation, automatic compliance & certain cost savings. 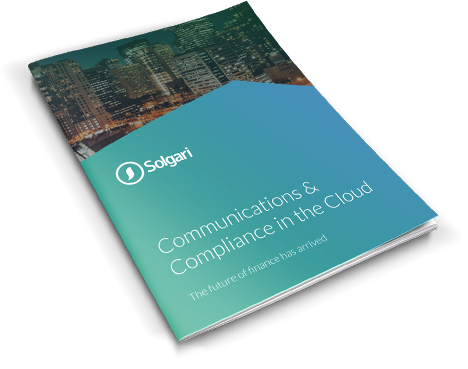 Solgari has customers in 34 countries to date using all the digital communication channels – including voice, WebRTC video, chat, IM & SMS – in the cloud, while addressing local and international compliance requirements through a per user per month SaaS model. Growth: Contact center software market expected to increase from US$17.65 billion in 2018 to US$35.32 billion by 2023 at a CAGR of 14.9%. Regions: North America leads the market, followed by Europe with APAC expected to experience the highest growth rate. Cloud: Is expected to grow fastest due to low cost and higher adoption among small enterprises. SMEs: Contact center software, particularly cloud based, is gaining traction with SMEs who focus on enhancing customer experience. Financial Services & Retail: These are the two key growth verticals with Financial Services contributing the most revenue and Retail growing quickest. The report can be accessed here ‘Contact Center Software Market Global Forecast to 2023’ with a key summary available here. Solgari’s services are currently available for a 2 weeks free trial at Trial Solgari or please contact our sales@solgari.com for more information or a demo. Our 850 full time analyst and SMEs at MarketsandMarkets™ are tracking global high growth markets following the “Growth Engagement Model – GEM”. The GEM aims at proactive collaboration with the clients to identify new opportunities, identify most important customers, write “Attack, avoid and defend” strategies, identify sources of incremental revenues for both the company and its competitors. MarketsandMarkets™ now coming up with 1,500 Micro Quadrants (Positioning top players across leaders, emerging companies, innovators, strategic players) annually in high growth emerging segments. MarketsandMarkets™ is determined to benefit more than 10,000 companies this year for their revenue planning and help them take their innovations/disruptions early to the market by providing them research ahead of the curve.